The Nesco Vital Wheat Gluten is the natural protein derived from wheat flour. 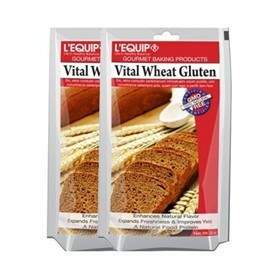 Adding this product to your whole wheat bread recipe results in improved uniformity and texture.This wheat gluten enhances natural flavor, expands freshness and improves yield. It provides strength and stretch to dough and also improves yield and shelf life. The Nesco 860920 (2-Pack) has many exciting features for users of all types. The Nesco 860920 (2-Pack) is sold as a Brand New Unopened Item.